… meanwhile, on the inside, it was nothing more than just a very well done cafe. Nothing was at all that crazy-exotic or over-the-top – it just had great coffee (we brought some back for a), great pastries (omg the pistachio croissant has changed my life – I will never eat an almond croissant ever again – and g nearly lost her mind with the strawberry turnover seen above), great service, and a tasteful assortment of minimalist decor. 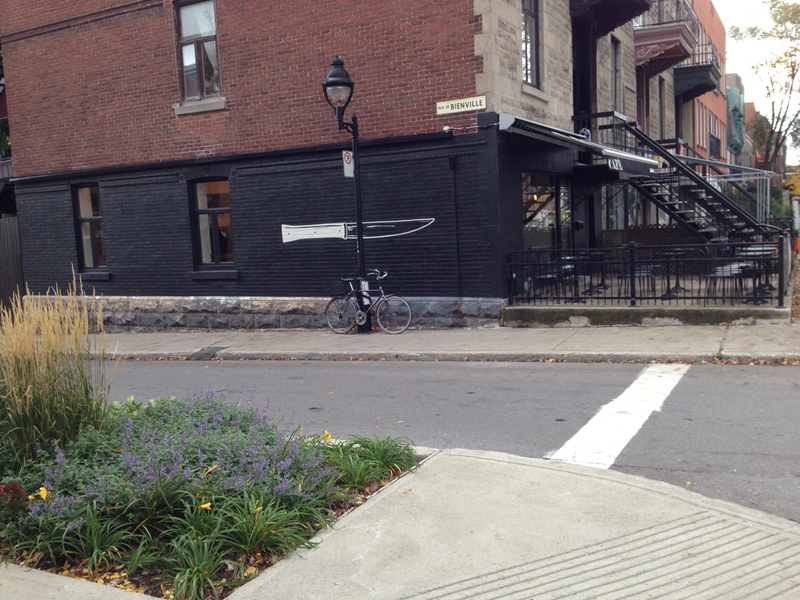 If we lived in MTL, I’d live around this coffee shop just so I could go there every day. For real. Don’t test me. 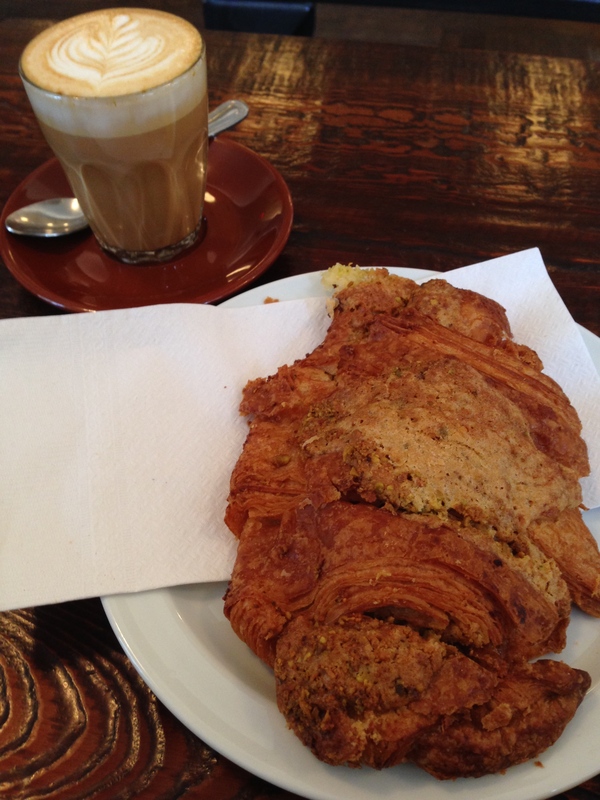 … here is that pistachio croissant (and cortado) I raved about … pictures do not do it any justice at all. 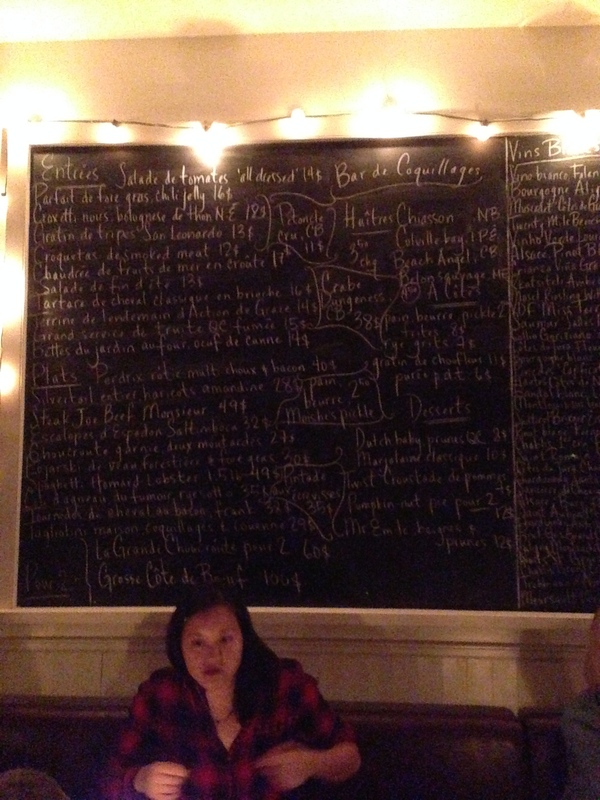 Above is the menu for Joe Beef (and some random stranger). 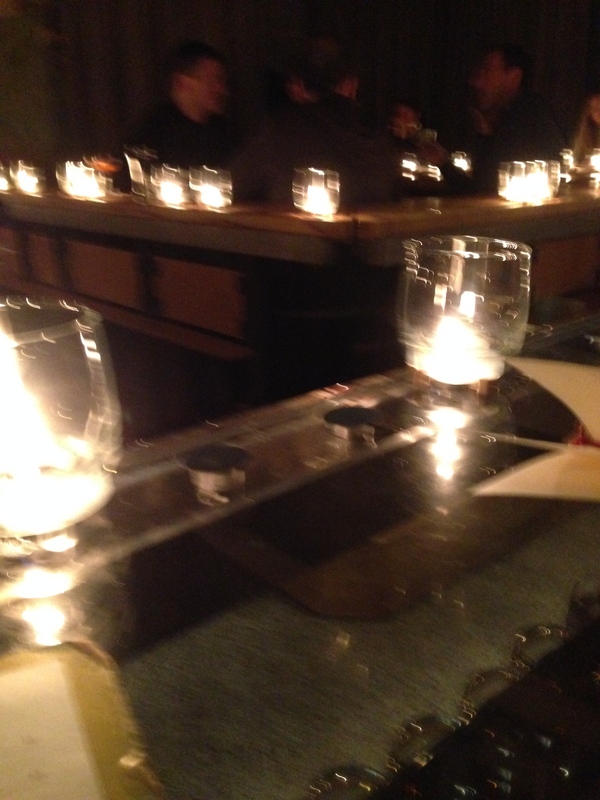 None of the pictures of the food turned out, so I’ll just say my piece here … Joe Beef is VERY over-hyped. It does not serve the “best food in the world”, or whatever accolade that Dave Chang put on it. Sure, it serves “good food”, but “best” is a tough superlative to attach; it’s good raw ingredients, done very nicely, and with a dash of “extreme”. For instance, the steaks are huge. Foie is everywhere. They use off cuts of meat all the time. So … it’s like [what I think would be] a chef’s dream come true: good ingredients, done in a not-fussy manner, but done very well, and served in a very friendly, bar-like environment. Unfortunately, Joe Beef is less a gathering place for locals, rather a tourist attraction for people looking to get that stupid Foie Double-down (google it). So what did we eat? g went for “Lobster Spaghetti” … and despite my previous rant, I now have to admit that it blew her face off. She initially said “gee, this is huge – I’m totally taking some of this home” when it first hit the table, and then she took a bite, and then she completely blacked out for about 15 minutes, and when she came to, her pasta was gone. And it was a HUGE dish. It had 1.5 lbs of lobster on it! I did sneak some, and it was quite tasty – not like elegant, complex or anything like that – it was just straight-up “good” – I’m not a huge lobster fan, so I didn’t also lose control, but I can see how some people might (g chimes in: i feel a little ashamed – i mean – how did I eat it all?). It’s rare for g to eat herself into a stomachache, so this is pretty high praise for Mr. Beef. 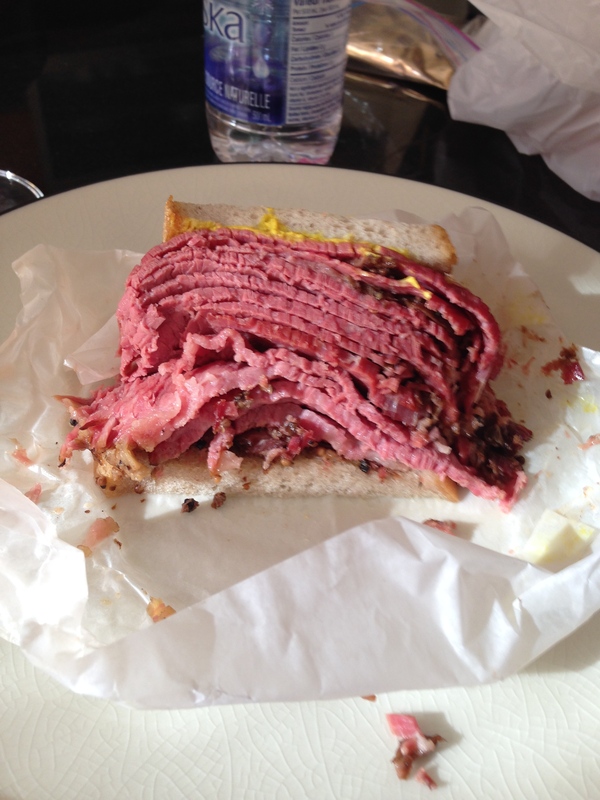 As for me, I asked the server for “something piggy” – and he instantly responded “go for sauerkraut” … so I did. Despite not having anything piggy in the title, it features two cuts of pork and two giant sausages. It was quite solid – it was like something out of Cochon’s playbook – once again – my socks remained on my feet, but I was net-happy with what I got. 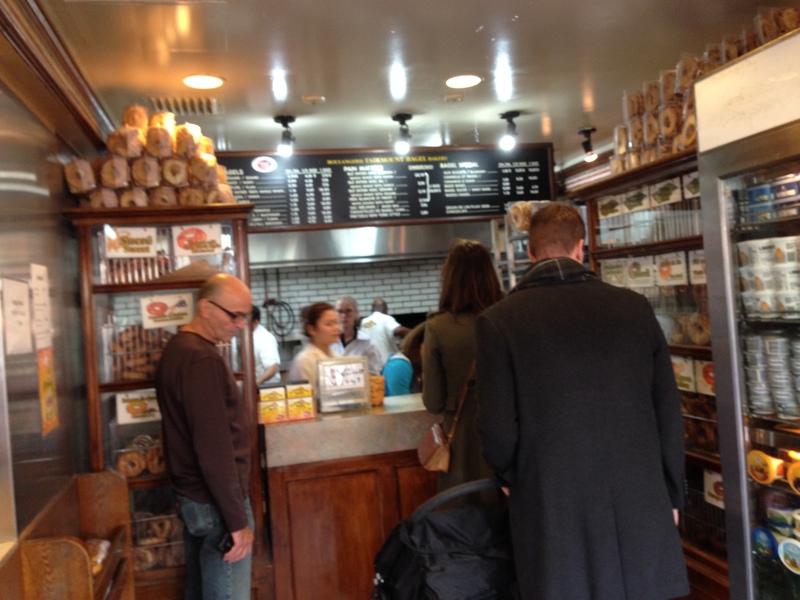 We did Fairmount bagel despite everyone saying St. Viateur was better (Fairmount was closer). The fun was that while walking there, I witnessed three females beat the crap out of a male after a disagreement while exiting a cab. I have no idea if they were Canadian or not (they weren’t yelling in French which makes me think not), but it was a sight to see! And to watch the natives spring into action: cars pulled over and guys jumped out to restrain the one dude so he wouldn’t hit back. Cops were called (and showed up in urban camo pants and bullet proof vests! Montreal cops are serious … no Mounties though …). It was crazy! … The bagels on the other hand, weren’t crazy; delicious, yes, crazy, no. But it definitely allowed me to see where Spread Bagelry is getting their inspiration from. 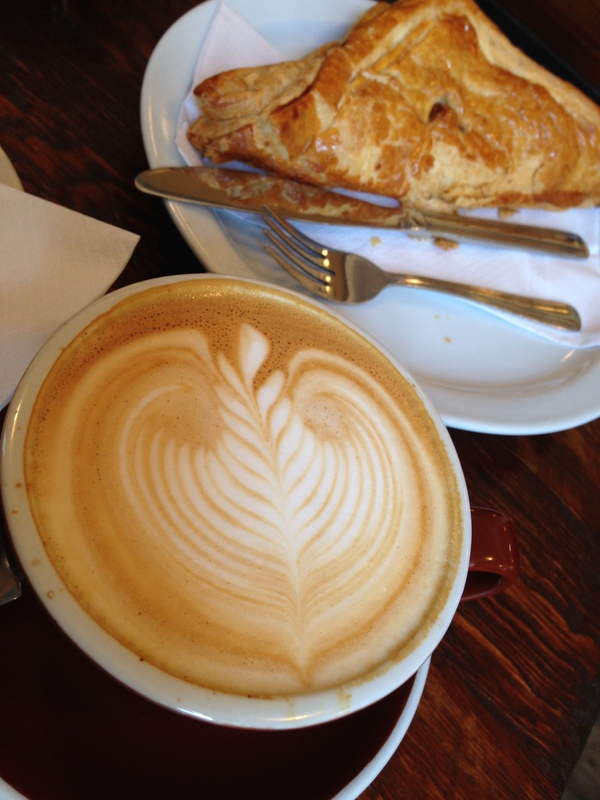 A nice start to the morning (even if I was wishing it was a pistachio croissant instead …). Dinner at Bouillon Bilk was SENSATIONAL. We loved it. 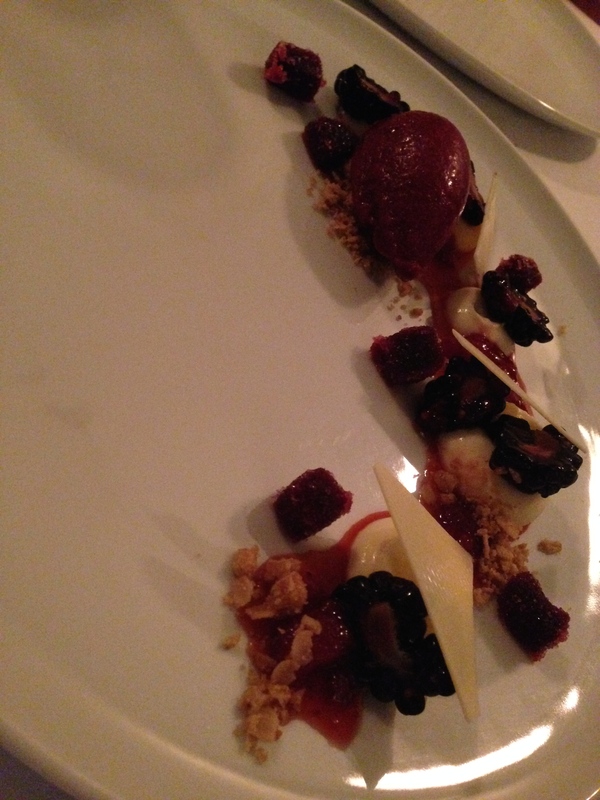 While not particularly “Canadian” or “French” in cuisine, it was superb flavor combinations, cookery, and service. Maybe the one drawback is we would have preferred a slightly more interesting bread than what was provided (it was a little anemic for our taste). 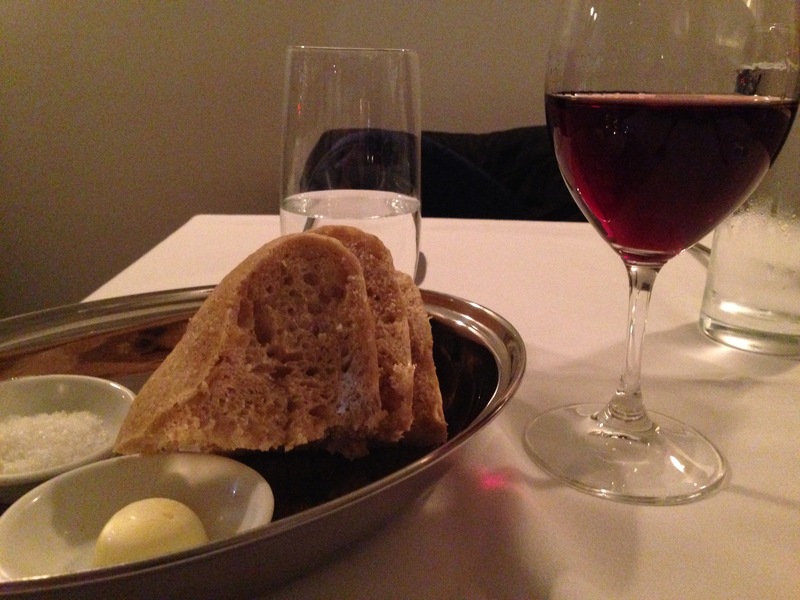 However, whatever points they lost on bread, they more-than-made-up-for with that Bourgogne I drank. It happened to be from Guy Amiot et Fils – the winery we happened to visit when we were in Beaune!!! It was everything Bourgogne should be: light-to-medium weight, some snappy fruit up front followed by a nice evolution of savory/dirty flavors afterwards, and a mouthwatering acidity to prepare you for some more food or drink. Loved it. Would buy it by the case if it were available here. 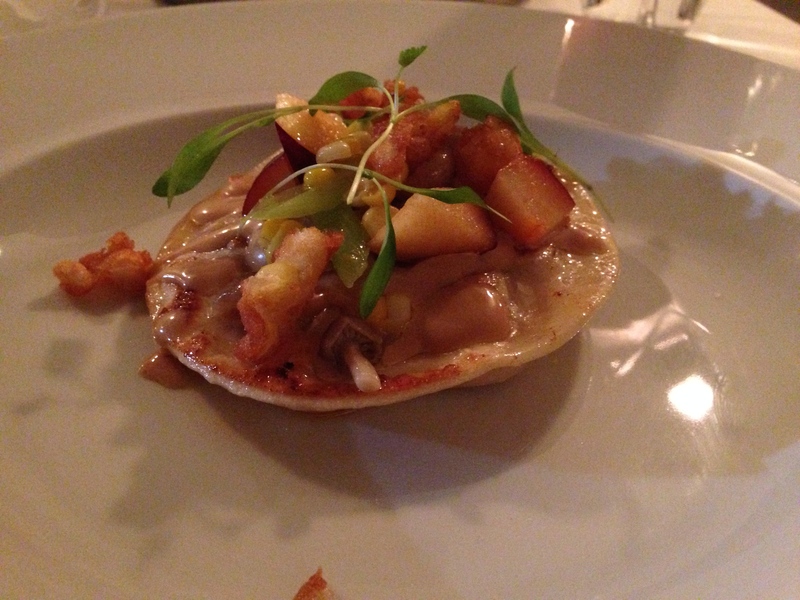 This is a “dumpling” topped with mushrooms, fruit, corn, and other various things. It was like an Asian dumpling, but take every possible flavor and make it more pronounced, but at the same time, balanced. Like even if I had all these ingredients on hand, I doubt I would ever be able to strike the balance of sweet (from fruit and corn) with the savory. I would have eaten three of these … and trust me … I love bashing crappy wonton-wannabes, which this was not. 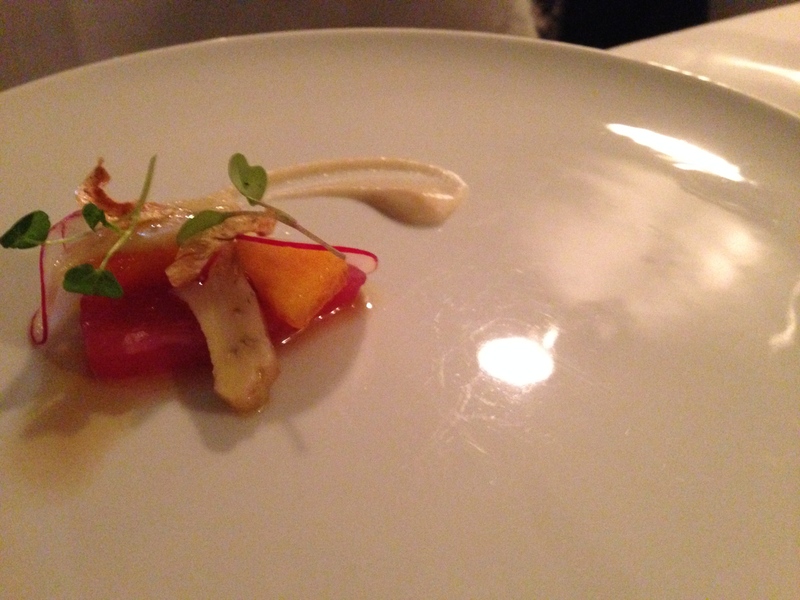 Tuna amuse. They lose points for presenting an amuse on a GIANT plate. That’s pretentious and stupid. Don’t do that. They also lose points for it being larger than one bite. BUT … they instantly gain it back because this was perfect, and I was happy I had a second bite left after my first. I had no idea what was in it but damn they nailed it. 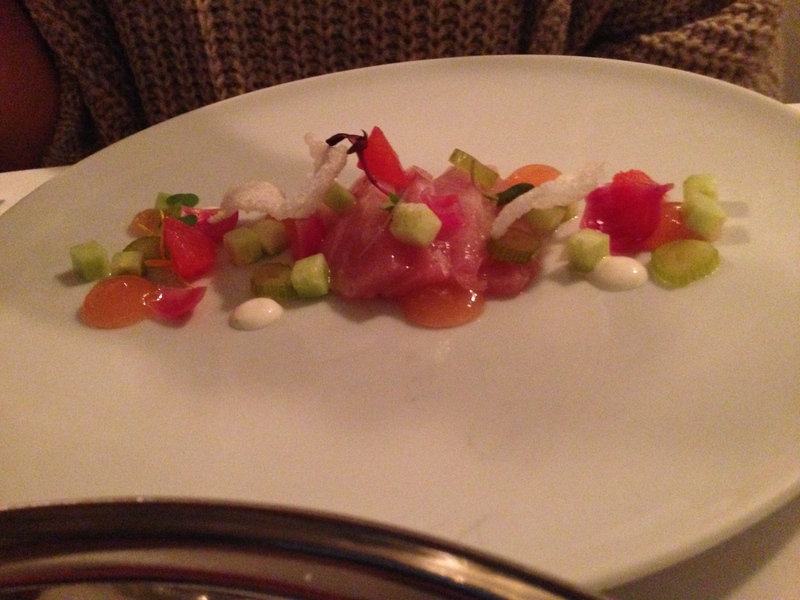 And then g had the crudo (g says: surprise!) This yellowtail was nicely done, with great textures put in there (there was some kind of foamy cracker and some gel). The “veal dish”, which was a special, rivaled the best thing I’ve eaten in the past few months (which was Fond’s Pork Belly). 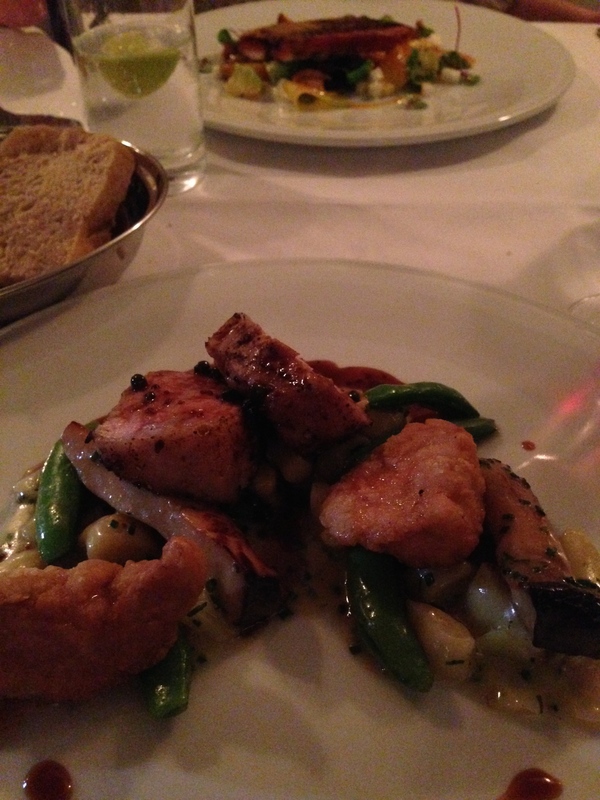 Perfect sweetbreads. Perfect veal medallions. Perfect greens. Perfect gnocchi. 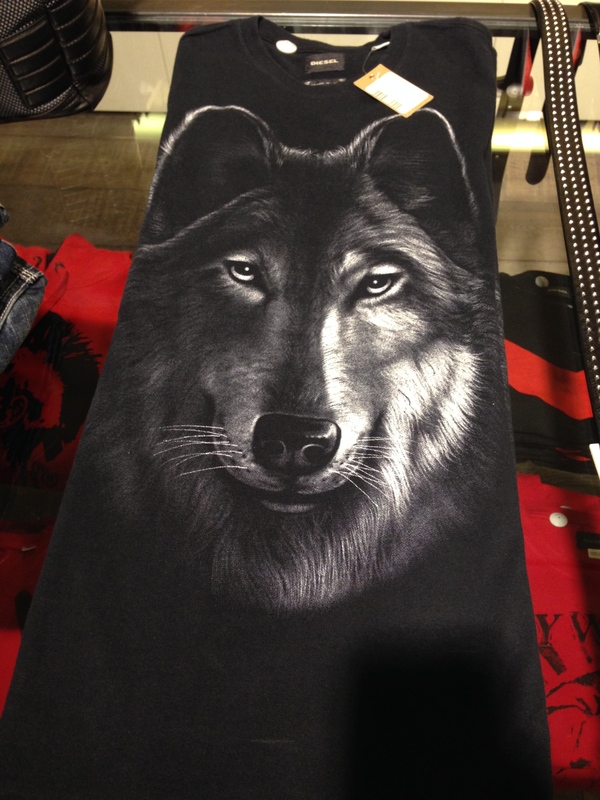 I died and went to heaven. And then I took a sip of the aforementioned Bourgogne, and then I went straight to hell, because to taste that good must be the work of the devil. Drawback? I have none. In the background was g’s fish. I completely forget what she ate, as I blacked out like g’s experience with Joe Beef’s lobster spaghetti, so anything g said during that time, I can’t remember … Oh, and did I mention that they gave me a non-serrated steak knife! Hooray!! I mean, it could have used a sharpening, but at least it shows that someone is taking pride in their work so as not to force me to tear it apart with jagged points. Very nice. Believe the hype of Bouillon Bilk. Yea, there are some yelp tourists, but even the Canadians are dying to get in. And then, on the morning we left, we visited Guillaume boulangerie, which had a great assortment of baguettes and other baked goods. Definitely a place we should have used more often during our trip (it’s one of the top three baguettes in MTL!). 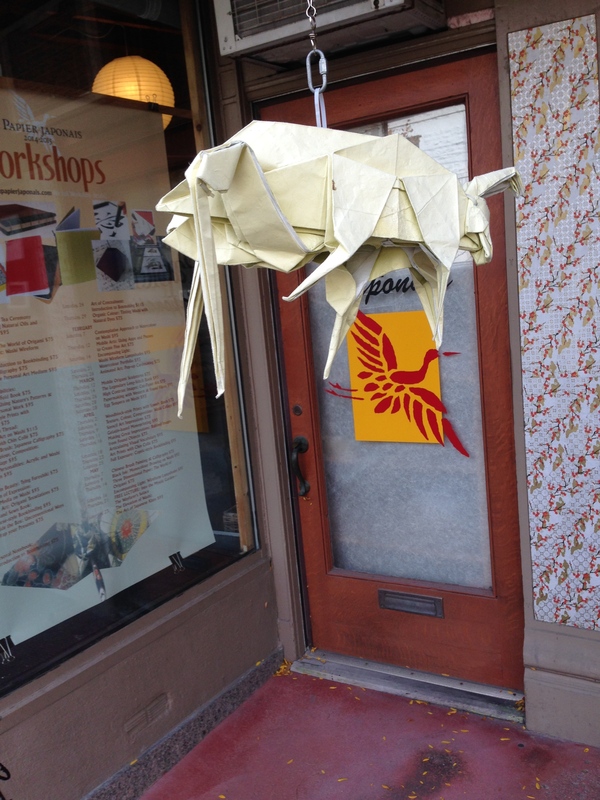 Japanese paper (for origami) store … with an origami grasshopper hanging outside!